Hawaii isn’t all beaches, sunsets, and palm trees. One of the first things to strike me each time I visit the lush (Hilo) side of the Big Island is the abundance of wild flora considered “exotic” back home. Here, nobody thinks twice about roadside hibiscus, bougainvillea, impatiens, or orchids that would (at the very least) require a trip to Home Depot and months of nurturing to enjoy on the Mainland. 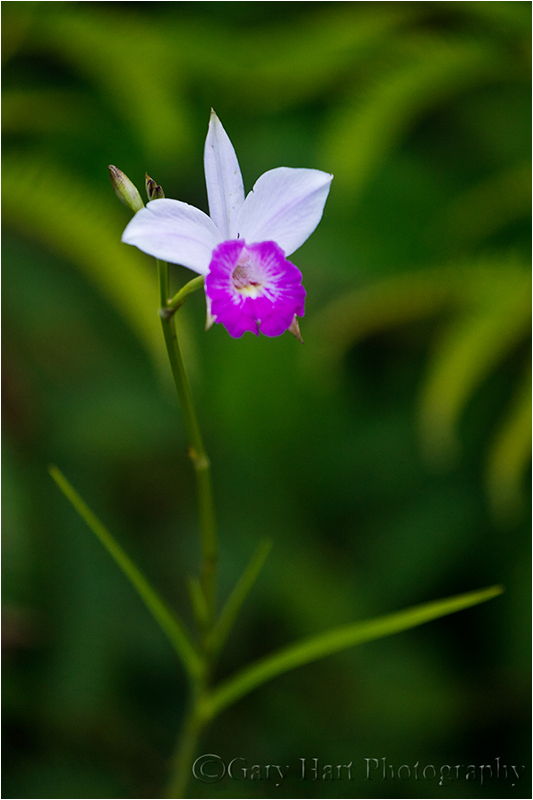 I found this orchid while wandering the trail at the back of Lava Tree State Park in Puna, south of Hilo. Directly across the path from me was a tree draped in yellow hibiscus; just around the next bend the jungle opened to reveal a field of pink orchids stretching a hundred yards to more jungle beyond. This lone orchid was a harbinger of what lay ahead, but before moving on I took the opportunity to isolate it against a background of arcing ferns. Bouncing between beach sunrise/sunset and rainforest macro scenes can lead to visual whiplash. But the same compositional rules still apply: Find your subject, identify a complementary foreground and/or background, and eliminate distractions. Composing this scene, I thought the dark green ferns made an ideal background for this brilliant pink orchid and carefully positioned myself so the the arcing fronds framed the orchid without intersecting it. Exposing for the bright bloom turned the deepest shadows a natural dark forest-green velvet backdrop. To prevent the intricacies of ferns’ lacework fronds from competing with the orchid, I opted for a large aperture that softened everything but the stamen. Cindy….do you share your photos…love to see artist contributions, esp. artist who understate their works…. That’s something I’ve thought about doing, but don’t yet have a mechanism in place.